Dodgers center fielder Matt Kemp will begin rehabilitation assignment tomorrow in Rancho Cucamonga. Dodgers manager Don Mattingly said that center fielder Matt Kemp will begin his long-awaited rehabilitation assignment tomorrow with Single-A Rancho Cucamonga. Kemp is scheduled to be the designated hitter in the Quakes’ 7 p.m. home game against the High Desert Mavericks. “He passed all the tests,” Mattingly said. 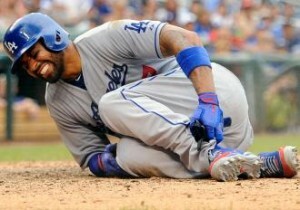 Kemp sustained what’s believed to be a severe Grade 2 ankle sprain on July 21 in a game against the Washington Nationals. It was Kemp’s first game back after missing 15 days with inflammation in his right shoulder. Wednesday was Kemp’s second straight day running the bases and making cuts in the outfield at close to full speed. Kemp left without speaking to reporters after the game. This entry was posted in JP on the Dodgers and tagged Matt Kemp, Rancho Cucamonga by J.P. Hoornstra. Bookmark the permalink.